Opis: The stark surface of Earth's moon is pocked with large craters, records of a history of fierce bombardment by the solar system's formative debris. It may be difficult to imagine, but nearby planet Earth itself has endured a similar cosmic pounding, though oceans, weathering, and geological activity have removed or hidden many of the telltale scars. 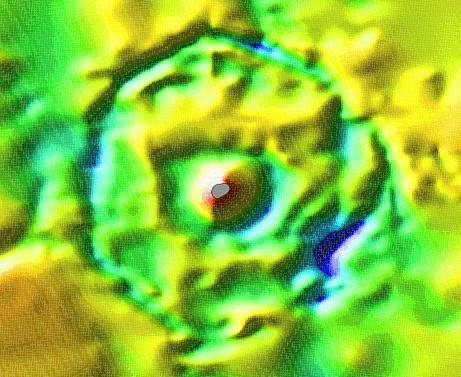 For example, this false color image produced from seismic data shows a recently discovered ringed structure about 24 miles wide on the floor of the Barents Sea. It is most probably the result of the impact, roughly 150 million years ago, of a mile or so wide asteroid-like body. Estimates indicate that the energy released in the impact could have been as high as a million megatons of TNT, resulting in immense earthquakes and tidal waves. Drawing on Norse mythology, the crater has been aptly named Mjølnir - Thor's hammer.